Since 1977, the Journal of Pragmatics has provided a forum for bringing together a wide range of research in pragmatics, including cognitive pragmatics, corpus pragmatics, experimental pragmatics, historical pragmatics, interpersonal pragmatics, multimodal pragmatics, sociopragmatics, theoretical pragmatics and related fields. Our aim is to publish innovative pragmatic scholarship from all perspectives, which contributes to theories how speakers produce and interpret language in different contexts drawing on attested data from a wide range of languages/cultures in different parts of the world. 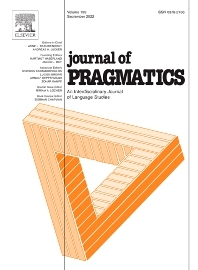 The Journal of Pragmatics also encourages work that uses attested language data to explore the relationship between pragmatics and neighbouring research areas such as semantics, discourse analysis, conversation analysis and ethnomethodology, interactional linguistics, sociolinguistics, linguistic anthropology, media studies, psychology, sociology, and the philosophy of language. Alongside full-length articles, discussion notes and book reviews, the journal welcomes proposals for high quality special issues in all areas of pragmatics which make a significant contribution to a topical or developing area at the cutting-edge of research.